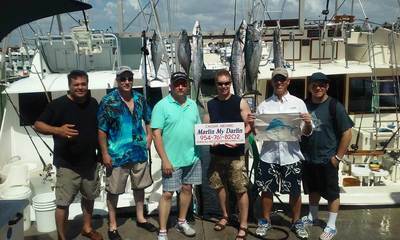 Offshore things are picking up and this Fort Lauderdale fishing report will address some decent fishing here. Kingfish continue to bite on most days on the inshore reefs in water from 90 to 200 feet. The braided line fished on our planers continues to far out fish the surface lines. This summer the heat has been continuous and troll fishing below the surface pays off. The summer Bonito continue to grab the Kingfish baits on the deep lines as well. We see them on the top more often now as their numbers are increasing and will be probably thick on the reefs by mid August. Wahoo as well on the deep lines when Kingfishing and also we target them just off the edge as well. Still seeing action from those summer Sailfish but not quite as good as last weeks fishing. We have spent the majority of our days on or near the inshore reefs trying to keep our anglers busy with the fish available there. It has been a safe bet and typically pays off with a mixed catch of fish. Capt. Chris did have a request for a Mahi-Mahi trip out in the deep and managed seven decent fish with smaller ones taking baits as well but then being released due to being undersized. Bottom fishing has been fair but the ?Blue Moon?, referred to as the ?!3th? (an extra moon for the year) has got the current really moving.